Ministry of Science and Technology, GoPk. The International Nathiagali Summer College on Physics and Contemporary Needs (INSC), was founded by Nobel laureate in Physics Dr. Abdus Salam (then-Science Advisor to the Prime minister) to promote physics and scientific research activities in Pakistan. Having suggested by Professor Abdus Salam to the Government of Pakistan, it was established by the Pakistan Atomic Energy Commission's chairman Mr. Munir Ahmad Khan. An annual college based summer camp, it is organized by Pakistan Atomic Energy Commission and National Center For Physics while it is sponsored by International Center for Theoretical Physics and the Minister of Science and Technology of Pakistan. A Physics research center, it is located in Nathiagali city of Pakistan, and its current director is dr. Riazuddin, a pupil student of professor Salam. Breaking the intellectual isolation of the scientist in the developing countries. Keeping pace with the rapid progress in science and contemporary needs by promoting higher science education. Placing due emphasis on the interaction of modern trends in physics and their applications in current technological development with special reference to the needs of the countries of the third world. Promoting a scientific dialogue and provide opportunity and opening avenues for cooperation and joint research programs. Indicate the areas where research could be carried out with limited facilities of developing countries. Professor Abdus Salam had played a major and an integral role in Pakistan's science policy. Professor Salam had supervised more than 21 PhD during his teaching career at the Imperial College, United Kingdom. Half of these students were Pakistanis in which the majority of students had returned to Pakistan to join Abdus Salam. To promote scientific activities in the country, professor Abdus Salam had done the ground breaking work in establishing the research facilities throughout the country. In 1976, Abdus Salam had suggested to Roger Penrose (Mathematical Physics), Oliver Penrose (Mathematics), Alice Hanson Cook (Cornell University), Benjamin Whiso Lee (physics), Mujaddid Ahmed Ijaz (physics), Remo Ruffini (Physics) and others had attended the college. Professor Riazuddin, who was at the time Chief Scientist (CS) at the PAEC, was overall in charge of organizing the college both administratively and academically. He also was the co-director of the college with alongside of prof. Abdus Salam. After the departure of Professor Salam, Riazuddin has been director of the INSC since then. 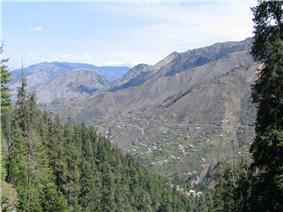 The INSC is located in Nathiagali, Pakistan. The scientific organizations, such as PAEC, KRL, NCP, PCSIR and PEC, had delegated and invited hundreds of scientists from Asia, Africa, Europe, and Americas to participate in the annual event. During the last 32 years of INSC, nearly 950 foreign scientists from as many as 72 countries have participated in the proceedings of the College. INSC has served as a forum for people of different countries whose main problem is scientific isolation. In 2010, approximately 6200 Pakistani scientists, engineers, and mathematicians had attended the college. The vast interaction among Pakistani scientists who have been drawn not only from research institutes but also from universities and colleges. As of today, the college hosts post graduate students are invited to participate in this discourse of a high level. This link with universities and college is important since the ultimate source of technical manpower in any country is none other than the educational institutions. ^ Ijaz, Muhammad. "Pakistan's nuclear capability is purely for defensive purpose: PAEC's contribution towards defensive and socio-economic development laudable.". PakAtom: Newsletter of the Pakistan Atomic Energy Commission: 1–2. Retrieved 2011. ^ Salahuddin, A.; M. M. Awais (2005). "International Nathiagali Summer College on Physics: The Pioneers". The Nucleus (Islamabad, Islamabad Capital Territory: Pakistan Atomic Energy Commission) 42 (1-2): 123–127. ^ "1st International Nathiagali Summer College (1976)". ^ (INSC), International Nathiagali Summer College on Physics and Contemporary Needs (Updated). "Organizers". INSC, PAEC, NCP. INSC. Retrieved 2011. ^ (INSC), International Nathiagali Summer College on Physics. "Achievements". INSC. ^ "Ibid of Achievement section".